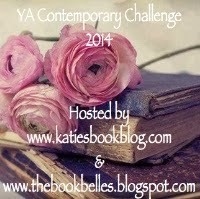 So, I've decided that this year, I'm going to participate in the YA Contemporary Challenge hosted by Katie's Book Blog and The Book Belles. 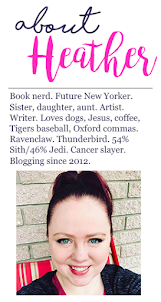 I actually heard about it from Rachel at Fiktshun, but I've been a follower of Katie's for a long time and love her blog! As some of you might know, I didn't really get into YA contemporary until late last year. I've always been more of an anything-but-contemporary kind of girl, mainly because the contemporary stuff I'd read was all major Debbie Downer kind of stuff. But after reading Katie McGarry's Pushing the Limits, I discovered I was missing out on all kinds of amazing things. Since then, I've been trying to push myself to read more books from that genre and I have NOT been disappointed. I have a big reading goal in general this year -- 100 books for the year (not all contemporary, obviously). It's not out of my reach. In 2012, I read 80 books when my goal was 50 books. But I didn't become a blogger until the end of 2012 and strangely, since I started blogging in 2013, I feel like I got more overwhelmed and like I was being pulled in all kinds of directions and not being sure what direction to take the blog. So I'm doing more challenges to try and keep me moving and to also try and not get stuck in a rut. I've got a BUNCH of contemporary reads on my TBR shelves and I have even more on the list of books I want to read/buy/get at BEA or something like that. That said, it's still not my bread and butter or the thing I naturally gravitate to. So, for that reason, I'm going to make my goal at least ten books, which is considered to be "Level 2." This will be the post I use to keep track of my reading as I go! Okay ... so who's going to join me on this and go contemporary?